Almost all of the troops on Luzon were now north of Manila. The North Luzon Force stood on the D-5 line, from Bamban to Arayat, in front of San Fernando and the road leading into Bataan. 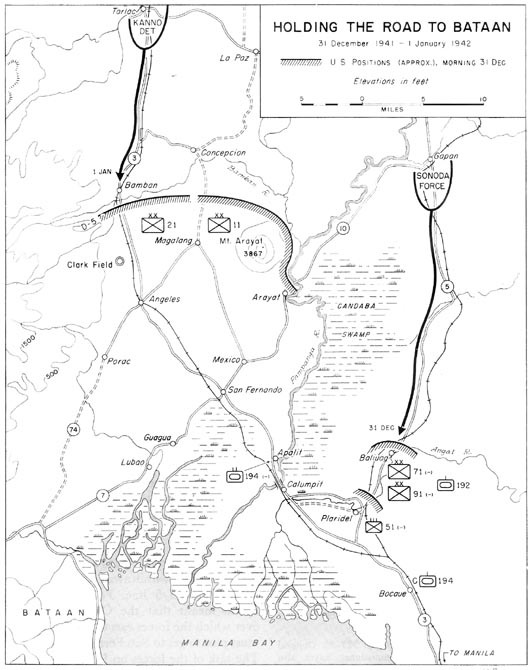 (Map 8) Fifteen to twenty miles long, this line was the shortest of the five defensive lines used by General Wainwright's forces. Guarded on the left (west) by the steep heights of the Zambales Mountains and on the right by the rugged 3,367-foot high Mt. 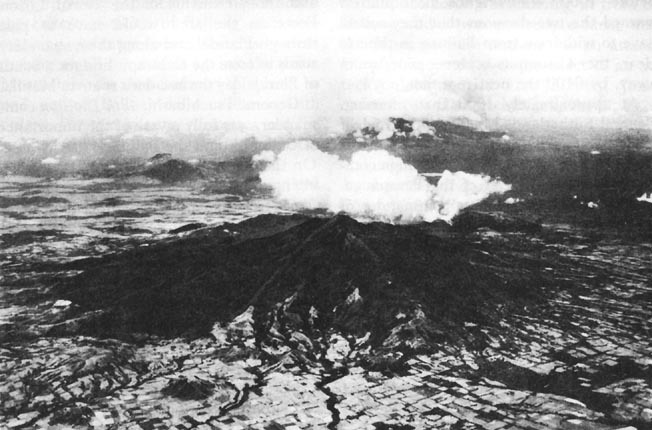 Arayat and the twenty-mile-long Candaba Swamp, it was susceptible only to frontal attack by the Japanese force moving south from Tarlac along Route 3. Ten miles south of Bamban, the west anchor of the D-5 line, an unimproved road, Route 74, branched off from Route 3 to the southwest to give access to Bataan. The main road into the peninsula, Route 7, began at San Fernando, ten miles farther south. Troops north and south of San Fernando would have to pass through that town to get to Bataan; only the left elements of the troops on the D-5 line would be able to use Route 74. General Homma's main striking force was not aimed at the D-5 line, but at Manila. This force, which had broken through at Cabanatuan on the 30th, was moving rapidly down Route 5, east of the Candaba Swamp. Once it reached Plaridel, where a road led westward to Route 3, it would be only a short distance east of the two bridges at Calumpit. If the Japanese secured Plaridel and the bridges quickly enough, they would cut off the retreat of the troops still south of Calumpit and, by gaining a position west of the Pampanga River in the rear of the D-5 line, compromise the execution of the withdrawal into Bataan. hold long enough at either point spelled the doom of the entire plan. 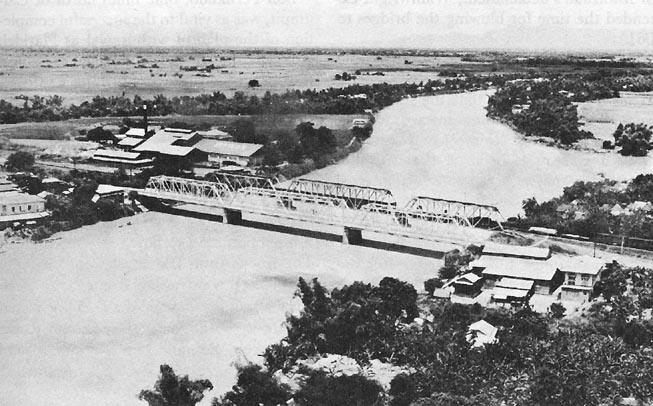 For the defense of the Calumpit bridges MacArthur placed every unit that could be spared east of the Pampanga. From the South Luzon Force came the 51st Infantry (less 1st Battalion) and the 75-mm. guns of Colonel Babcock's SPM provisional battalion, both stationed at Plaridel. The 194th Tank Battalion (less Company C) was posted at Apalit, on the west bank of the Pampanga two miles above Calumpit, in position "to insure the exit" of those forces east of the river. If necessary, the tank battalion was to move to Bocaue, between Manila and Plaridel, to reinforce Company C, part of the South Luzon Force, which was to hold that barrio "until the extrication of North and South Luzon Forces was insured. "2 At least one company of the 192d Tank Battalion was in the Plaridel-Baliuag area. The 91st Division, retreating down Route 5 from Cabanatuan, reached Baliuag at daybreak of the 31st. It was joined shortly by elements of the 71st Division- the 71st Field Artillery and the 71st and 72d Infantry-which had been ordered there the night before by General Wainwright. The 71st Division units took up positions north of Baliuag and the 91st Division went into reserve south of the town. The defense of the Baliuag-Plaridel area was of the greatest importance. Baliuag, a town of rambling houses and nipa huts scattered along Route 5 and the north bank of the Angat River, commands the approaches to Plaridel, six miles to the south. Plaridel is located at the intersection of Route 5 and several secondary roads, two of which extend along opposite banks of the Angat River to Route 3 and the Calumpit bridges, some eight miles to the northwest. The South Luzon Force and those elements of the North Luzon Force in the area would have to pass through Plaridel and along these secondary roads to cross the Calumpit bridges. South of Plaridel lay the invader's route to Manila. Stevens' efforts to halt the withdrawal of the 71st Division infantry elements proved futile. By 1500 the main body of Sonoda's mechanized force was standing in front of Baliuag and it was perfectly evident that the Japanese were massing for an attack. Deeply concerned over the effect of an attack on the untried 51st Infantry, Jones ordered two platoons of Company C, 192d Tank Battalion, to cross the river and attack the enemy concentration at the east end of Baliuag. The tanks were to be supported by about a half dozen of Colonel Babcock's 75-mm. SPM's which were to fire on Baliuag and its northern approaches when the tanks broke off the attack. 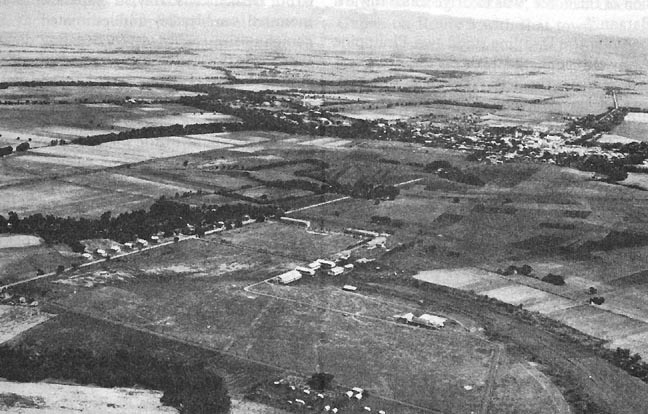 After a hasty reconnaissance, Babcock placed his guns on the dry, baked fields a few thousand yards west of Baliuag arid sent a forward observer to a position 500 yards west of the town. For communications with the tanks Babcock had a radio-equipped scout car of Company C.
What the Japanese could not accomplish on the ground they might have accomplished with their air force. On 31 December the highway and railroad bridges spanning the Pampanga at Calumpit presented to the Japanese air force the most inviting target since Clark Field. Heavily laden with dynamite charges for rapid demolition and protected by only two gun batteries of the 200th Coast Artillery (AA), the bridges were extremely vulnerable to air attack.11 Indeed, like marriage, in Shaw's classic definition, they combined the maximum of temptation with the maximum of opportunity. CALUMPIT BRIDGES spanning the Pampanga River. At about 0500 on New Year's Day, as the 51st Infantry cleared the Calumpit bridge, General Wainwright asked Generals Jones, Stevens, and Weaver if all their units were safely across. He received affirmative replies from these three, but Colonel Skerry pointed out that a platoon of demolition engineers under Lt. Col. Narcisco L. Manzano (PS) was still on the road south of Calumpit. Nothing had been heard from Manzano since the previous noon, and Colonel Skerry requested that destruction of the bridges be delayed as long as the tactical situation permitted, to enable Manzano's group to escape. Wainwright assented, but all final preparations for demolition were made and orders were issued to fire the charges at 0600.
of Manzano's detachment, Wainwright extended the time for blowing the bridges to 0615. As dawn broke, the noise of enemy rifle fire from the south increased. General Wainwright, unaware that the main Japanese force was pushing toward Manila and that less than a regiment had been sent toward Calumpit, believed that this fire presaged a major Japanese effort to cross the Pampanga. Blowing the bridges would place the deep, unfordable river squarely in the path of the advancing enemy and give the Bataan forces time to prepare for defense. Wainwright then made his decision; Manzano and his men would have to reach Bataan by other routes. He turned to his engineer. "Skerry," he said, "we cannot wait any longer. Blow the bridges." The covering force withdrew to a safe distance, the explosives were checked, and at 0615 the charges were detonated. The air was filled with a roar and a rushing noise, a flash lit up the sky, and the Calumpit bridges disappeared in a mass of falling debris. In front of the defenders flowed the deep Pampanga; to their rear lay San Fernando, where the road to Bataan began. By the first day of the new year the bulk of the American and Filipino forces had escaped from the enemy pincer movement designed to trap them on the plain before Manila. Calumpit had been passed successfully and the troops from the south had side-stepped the Japanese and withdrawn in good order across the Pampanga. MacArthur's men no longer faced the main strength of Homma's 14th Army, which was pushing rapidly toward Manila. San Fernando, nine miles north of Calumpit, was as vital to the successful completion of the plan of withdrawal as Plaridel. Not only did the South Luzon Force have to pass through it before turning southwest to Bataan, but almost the entire North Luzon Force would funnel through that town also. Thirty-five miles northwest of Manila, and strategically second in importance only to the capital, San Fernando is an important road and rail junction. It is there that Route 7, the main road to Bataan, joins Route 3. The troops from Calumpit would have to travel northward along Route 3 to reach San Fernando; those on the D-5 line would withdraw south along this road and Route 10. At San Fernando both groups would pick up Route 7 for the final lap of their journey to Bataan. The 21st Division on the west flank of the D-5 line was the only unit which could escape into Bataan without going through San Fernando. At Angeles, midway between Bamban and San Fernando, it would leave Route 3 and follow Route 74 to Bataan. All other units north and south of San Fernando would reach Bataan via San Fernando and Route 7. Route 7 leading to Bataan is in upper left. Zambales Mountains are visible in background. where the vehicles were lined up almost bumper to bumper. On each side was an endless line of pedestrians, mostly civilians fleeing from the invading army. By 0900 the remainder of the Kanno Detachment had reached Bamban. The infantry soon began an attack against the river line and Company C; the artillery joined in the action about noon. That afternoon the fighting was brisk, with heavy shelling on both sides and with Japanese aircraft participating in the action. But all efforts by the Japanese to cross the river met with failure and Company C was still in position late in the day. to Bamban had been received earlier in the day, one scout noting "that one of our own tanks was being driven around Tarlac to the hilarity of the enemy troops. "22 These reports were accurate. The 9th Infantry and supporting troops were moving forward to reinforce the Kanno Detachment. As the Japanese came within artillery range they were brought under fire by guns of the 21st Field Artillery. Although suffering losses in personnel and equipment, the 9th Infantry by 1600 had joined the Kanno Detachment on the north bank of the river. But the Japanese for some inexplicable reason failed to attempt a crossing. At nightfall the 21st Division began to move out, Company C wading the shallow Bamban to rejoin the division. The entire division withdrew down Route 3 to Angeles, then turned southwest along Route 74 to Porac. The enemy followed cautiously and it was not until 1130 of the 2d that the Kanno Detachment reached Angeles. The Japanese now had possession of the Clark Field area. It was now the turn of the 11th Division to extricate itself and withdraw into Bataan. This division had recently been strengthened by the return from the Cagayan valley of about 1,000 of its men, drawn largely from the 12th and 13th Infantry Regiments. Its sector of the D-5 line extended from the Magalang-Concepcion road eastward to the Pampanga River. On the right (east) was the reorganized 12th Infantry, holding a front from Mt. Arayat to the Pampanga River and the town of Arayat. It was in position to guard against an unexpected Japanese advance toward San Fernando along Route 10, which connected Gapan on Route 5 with that town. Early on 1 January General Brougher, the division commander, ordered Colonel Townsend to withdraw his 11th Infantry, starting at 2000 that day. The regiment was to retire along the Magalang road through Mexico and San Fernando to Guagua, about fifteen miles from Bataan. guns, held firm, inflicting heavy losses on the enemy. A Japanese attempt to outflank the 11th Infantry line by pushing elements through dense fields of sugar cane met with failure. At 2000, the appointed hour, the 11th Infantry broke contact and began its withdrawal, passing through the 194th Tank Battalion in position east of San Fernando. By 0200 of the 2d the regiment had reached Guagua. During the night it was joined by the 12th Infantry and remaining elements of the 13th Infantry.24 With the successful withdrawal of the 11th Division, the troops on the D-5 line had made good their escape through San Fernando. Meanwhile the remaining troops south of that town were doing the same. Late on the morning of 1 January the Japanese reached Calumpit. The Tanaka Detachment (2d Formosa, less 3d Battalion, and a battalion of the 48th Mountain Artillery) had moved cautiously from Plaridel during the night and now faced the covering force across the wide, unfordable Pampanga. The sight of the Japanese at such close proximity was extremely disconcerting to the poorly trained Filipino troops. Their nervousness was increased by the sight of the Japanese bombers which passed overhead that morning on their way to bomb installations on Bataan. 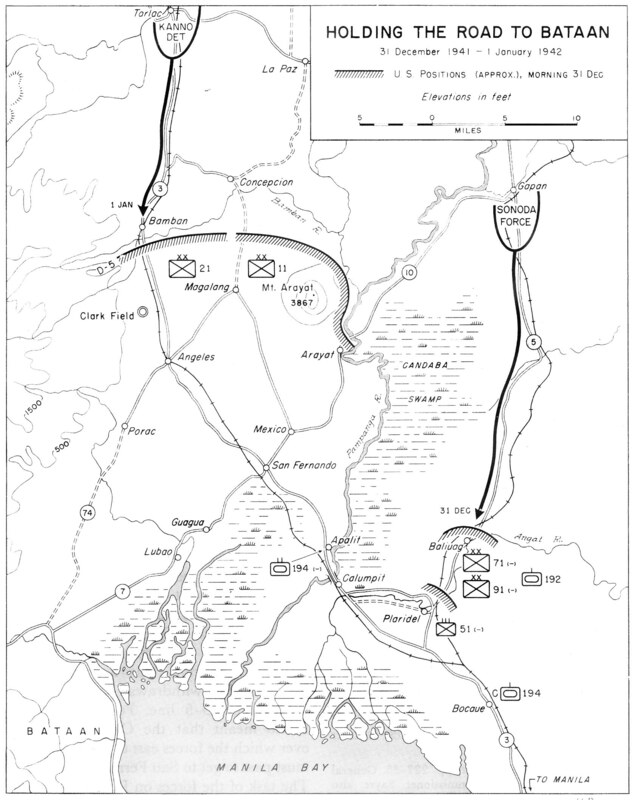 In the few days from 30 December 1941 to 2 January 1942 the North and South Luzon Forces had completed successfully the most complicated and difficult maneuver of the campaign thus far. They had held at Plaridel and along the D-5 line. A part of the force had crossed the Calumpit bridge, marched through San Fernando, and down Route 7 toward Bataan. Another part had withdrawn from the D-5 line, along the flat grassland west of Mt. Arayat to Mexico and San Fernando to join the others retreating down Route 7. The remainder had moved down Route 3 to Angeles and then along Route 74 to Porac. Everywhere the enemy had been held and the route of escape kept open until the last unit was on its way into Bataan.